Changes are good if they bring fruitful results for your venture. One such change is the introduction of AMP (Accelerated Mobile Pages), an admirable step by Google to provide faster loading time to websites on mobile devices. Before some time, Google brought a significant change in mobile search engine result pages by introducing AMP as a rank booster. Due to the positive results and industry demand, AMP has become a upcoming SEO trend to embrace. It is an open source project that was aimed at providing faster page load time by restricting unwanted elements from loading. Finally, Google successfully fulfilled the purpose of generating fast-loading websites on different mobile devices. In last decade, smartphones and tablets have completely changed the way people get their important data. The most immediate need to create accelerated mobile pages was the absolute control of mobile phones over the people. Wide usage and favorable results of implementing AMP encourage marketers to include this as their one of the best source to offer SEO services. AMP was introduced by Google as a big solution for the problem of user experience faced by mobile users. The primary thing that mobile users want today is the page speed which they can achieve now with AMP technique. It is an open source initiative which demonstrates the vision through which publishers can create mobile-optimized web pages & content only for once and upload it anywhere on the web. The best part is, this project relies on HTML markups in order to create fast loading and simplified version of your web design which loads within seconds on different browsers. AMP is completely out and has been contemplated to various benefits for search engine optimization. Among them, the major ones are quick loading pages and enhanced ranking factor. Utilizing accelerated mobile pages can take your website’s ranking to the top, the only thing required is absolute understanding. Today, we will take you through some of the major highlights of AMP that let you know how you can use it to benefit your business website. Before going in-depth, first, let us know how accelerated mobile pages work? In order to provide web pages a significant speed, developers divided AMP into three major parts AMP HTML, AMP JS and AMP CDN. AMP HTML is one of the special types of tags that are strictly defined as a set of pre-processing tags. The HTML tags used to develop accelerated mobile pages are mainly restricted to image embedding and text formatting. These major elements further help analyze information of a mobile device. This is the way AMP HTML works for developing quick loading web pages. AMP CDN (Content Delivery Network) is also known as AMP Cache. This factor is the most important and plays a crucial role in lifting a website’s rank. AMP CDN is the Google’s server system of working on lifting the heavy traffic towards your most recent content. It works by pre-positioning the content and circulates it all over the globe. This technique ensures that a page requested by the user not necessarily to be sent over a hierarchy. Instead of it, with the help of AMP Cache Google places a pre-defined and completely optimized copy of the requested page on the server and display it as AMP when needed. Hope, everything would be clear in your mind about AMP. 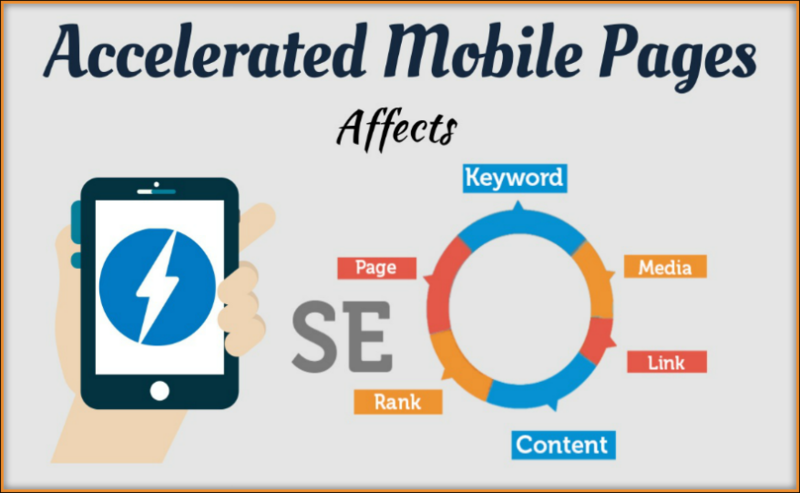 Now, let’s get started with extravagant advantages of accelerated mobile pages in contrast with SEO. AMP is highly beneficial for publishers. The reason is, search results clearly display AMP pages with green highlighted text which ensures clarity in users’ mind. This further results in increased click-through rates. Setting this concept in mind, users recognize AMP pages quickly and make it easier for publishers to get a wide variety of clicks. As AMP is introduced to give a profitable and right direction to the mobile optimization, search engine ranking has also segregated into two parts i.e., traditional & mobile search ranking. This is the advanced era where people prefer using their mobile devices more than accessing stuff through desktops or laptops. Although, implementing AMP as a rank-boosting factor will not only affect website’s ranking, but also add a charm to make users compel explore the linked services. People who are use mobile devices don’t prefer to give much time accessing stuff from their desktops or laptops. With the implementation of AMP project, a website’s content gets displayed in the carousel from where users can access the required stuff without even exploring the entire website. Once they like the information in the carousel, they will be allowed to visit the associated pages of a website. AMP helps improve conversion rates and website’s speed to a great extent. Today, approximately 90% of publishers are using AMP as a ranking factor and they are happy to attain higher conversion rates for their venture. Conversion is all about redirecting the traffic towards promoted stuff which fruitfully results in a high-rise in overall ranking of a website. Improvement in a site speed can keep visitors away from getting bored or frustrated with your site. Bounce rate is considered as an important factor in improving a site’s rank so, it should not get down at any cost. If you want quick and stable SEO results for your website, approaching AMP would be of great use. Being an open source technique, AMP constantly aims to support a wide range of ad networks, technologies and formats. The primary goal of AMP is to deliver ads that load fast on users’ mobile devices while allowing the placed content to look good on variations of screen sizes. This tactic helps marketers and advertisers increase their brand influence by earning great ROI on each ad spend. If a web page has AMP label, it generates greater possibilities to be clicked by users searching for relevant sources. It notifies that users are not getting frustrated by slow loading page and poor design. Even, they are enjoying fast-loading pages having a great user experience. Utilizing AMP increases click-through rates which directly affects SEO. These days, tracking visitors’ actions is one of the important facts to focus on. AMP also overcome this challenge by offering a detailed analytic report of visitors’ reactions. The analytic includes the overall visitors’ count (new & existing), clicks, conversions and link tracking. This is the excellent way to know how your AMP content is performing over the web. Undoubtedly, better website visibility leads to a large number of clicks and number of clicks lead to enhanced content readability among people. If the placed AMP content is informative, newsworthy and quality-oriented, then improved page visibility can automatically lead to creating a wide number of backlinks. Backlinks are one Google’s top three rank factors and matter a lot for a website’s rank. As you know that how backlinks are important for enhancing a website’s rank, the same technique can be applied for social sharing. When readers like your page content then it is more likely to be shared on other links no matter they are based in AMP or not. In this context, social media also works as a rank booster when comes in contact with accelerated mobile pages. Most of the marketers believe that Google AMP is here and not going anywhere else in upcoming years. Even, it is expected to be on a high-rise in SEO world. In the future, SEO service providers will only believe in creating AMPs to boost their website’s rank. If you are a marketer and still haven’t approached AMP as a ranking factor, this is the appropriate time to think about it. Definitely, you will get lucrative SEO results. Mobile users spend hours & hours a day on their smartphones, and they certainly won’t surf your pages and its content if your user interface (UX) is slow-loading, clunky, and not finger-friendly. This is great; I don’t understand before if mobile phone today is the essential factor for our SEO campaign, I think I am late for optimising my blog for mobile phone, AMP intended to increase speed and reduce loading time on mobile devices. This should get your content up and run as AMP, although since the WP plugin is still underdeveloped, keep in mind that there may be obstacles to implementing or modifying pages and the time that they presented on the AMP network. AMP is a blessing for both users and website owners. AMP is indirectly a search ranking factor as it helps in an accelerated loading of a web page. The visitors tend to click more on AMPs as compared to regular pages. AMP plugin also provides the options to configure your HTML for Google Adsense. Thus it’s an excellent opportunity of making money through Fast AMP Enabled WordPress Sites. I implemented AMP on my WordPress site, but after applying it, my website table in the post is showing irresponsive. Without AMP it shows responsive. I really guess someone should work on that. The HTML pages should have extra markup for this addon to transform them into AMP pages. If you know someone master with such a tool, please let us know or you can post more about it on your site. I have bookmarked.